WASHINGTON – Average premiums for insurance sold on the federal Obamacare health insurance markets will go down next year, the Trump administration announced Thursday, taking credit for the 1.5 percent drop. Rates in the 39 states that use the federal marketplace will drop as much as 26 percent in Tennessee for the mid-price level plans, while rising as high as 20 percent in North Dakota. 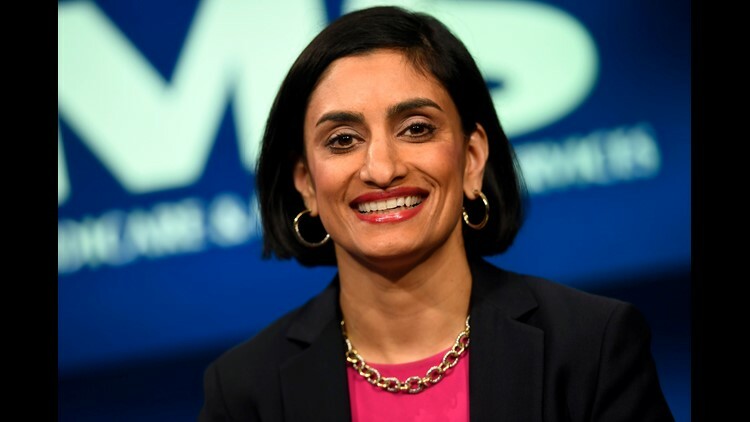 Centers for Medicare and Medicaid Services Administrator Seema Verma said premiums will decline overall for the first time since the marketplaces opened in 2014 because of steps the administration took to stabilize the market. "It is a dramatic and very positive change from the double-digit increases experienced over the past two years," she said. Independent experts said insurers raised rates to compensate for actions taken by the Trump administration. Premiums increased an average of 37 percent from 2017 to 2018 after the administration stopped reimbursing insurers for the reductions they're required to give lower-income customers on deductibles and other out-of-pocket costs. Insurers faced uncertainty about how other policy changes could affect how many customers sign up and how sick or health they would be. "Absent any policy changes, it is likely that insurers would generally have required only modest premium increases in 2018 and in 2019," researchers at the nonpartisan Kaiser Family Foundation wrote. The average premium for the "benchmark" plan that subsidies are tied to will be $406 next year. The highest cost is $709 in Wyoming. The lowest is $278 in Indiana. The premium changes – announced less than a month before the midterm elections, in which health care has been a dominant issue – are likely to continue the debate over whether Democrats or Republicans can do a better job at giving Americans affordable health care. Senate Democrats tried unsuccessfully Wednesday to stop the Trump administration from expanding the option of insurance plans that cost less but don’t include the same benefits as insurance sold on the exchanges, such as covering pre-existing health conditions. Most short-term health plans don’t cover prescription drugs, maternity care or substance abuse treatment. Critics of the plans argued they pull healthier people out of the Obamacare exchanges, raising rates for the sicker customers left behind. Verma said Thursday that average premiums would have increased for 2019, not decreased, if insurers expected that to happen. "We heard a lot of predictions that didn't turn out to be true," Verma said. Cynthia Cox, director of the Program for the Study of Health Reform and Private Insurance at the Kaiser Family Foundation, said some Trump administration actions probably helped stabilized the exchange. Shortening how much time people have to enroll and allowing several states to use "reinsurance" to protect companies from very high claims made the market more attractive to insurers, she said. "However, the Trump administration and Congress have also taken actions that have an upward effect on premiums," Cox tweeted. Those include the expansion of the short-term plans, cutting off reimbursements for cost-sharing reductions and repealing the tax penalty for people who don't buy coverage. The CMS did not release 2019 rates for states that run their own Obamacare exchanges. Of the 39 states that use the federal marketplace, rates will go up on average in 20 states, down in 16 and stay the same in three. There have been confusing mixed signals from the Trump administration on the ACA insurance market. One the one hand, they've taken numerous steps to undermine the market and warned that it's imploding. On the other hand, they have also taken some steps to promote stability.